A Fresh lotion is a natural lotion that doesn’t contain any chemicals or preservatives. This lotion by Free Range Mama contains chamomile, aloe vera , witch hazel and other ingredients. It’s a healing and soothing skin lotion. Chamomile is great for healing rough or damaged skin. Aloe vera has anti-inflammatory and anti-oxidant properties and helps regenerate the skin. Witch hazel is an anti-inflammatory and anti-microbial which can heal bruises and cuts. The recipe also includes other ingredients including essential oils. Free Range Mama provides clear directions and has some great tips at the end. The recipe itself is very simple. 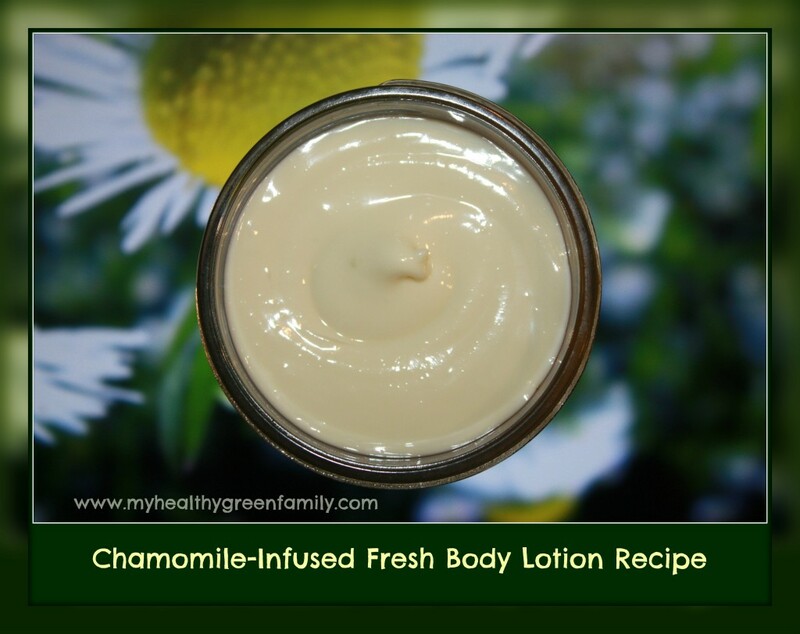 Click on the Homemade Chamomile-Infused Fresh Hand and Body Lotion Recipe link below to see the recipe.